Do you find that you get several clips after recording videos for some moving moments, memorial moments or wedding with some parts of unwanted segments? Aunsoft Final Mate is the recommended fast AVCHD/TOD/MOD camcorder partner for JVC, Canon, Panasonic, Sony users. It does not only support raw mts output, but also provides conversion to other formats like .wmv, .mp4. Why choose Aunsoft Final Mate as HDcam editing software? - Merge MTS/M2TS/TOD without conversion or re-encoding. - No quality loss for trimming/splitting/cutting videos. - 5X faster conversion with NVIDIA CUDA and Intel Acceleration technology. - Directly capture/import video clips from camcorder. - Native AVCHD support for editing on timeline. - Deinterlace 1080i files to get non-interlaced videos. - Convert MTS/M2TS/TOD/MOD to almost all formats. 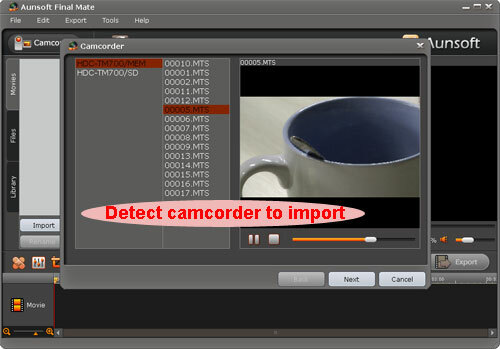 - Support and detect various camcorder models. Legeria/Vixia HG10, HG20, HF10, HF100, HF11, HF20, HF200, HF21, HF S10, HF S100, HF S11, HF S21, HF S20, HF S200. - JVC Everio GZ-HD7, GZ-HD3, GZ-HD5, GZ-HD6, GZ-HD30, GZ-HD40 (GZ-HD30 and GZ-HD40 for AVCHD and TOD recording). Everio GZ-MC100, GZ-MC200, GZ-MG30, GZ-MG70, GZ-MG37, GZ-MG77, GZ-MG505, GZ-MG130, GZ-MG155, GZ-MG175, GZ-MG255, GZ-MG555, GZ-MS100U, GZ-MG7230, GZ-MG630, GZ-MG670, GZ-MG680. SV-AV100, SDR-S100, SDR-S150, SDR-S10, SDR-H18, SDR-H200, SDR-H20, SDR-H60, SDR-S7, SDR-SW20, SDR-SW21, SDR-SW26. FS100, FS10, FS11, FS200, FS21, FS22.